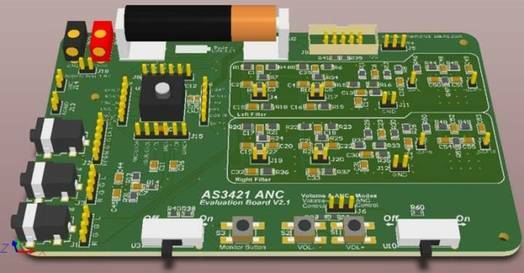 ANC evaluation kits allow for rapid prototyping of ANC enabled headsets, addressing the needs for mono/stereo, wired/wireless and feedforward/feedback topologies. Kits can also be combined to create Hybrid prototypes. The kits are accompanied by an easy to use Graphical User Interface and the necessary interface hardware to connect to a USB port of a PC. Updates of control parameters between GUI and the IC occur real time and can be modified as often as required. Only the burn process is limited to 4 times max.